is an Islamic authority which, among other functions, dictates whether Sharia Law has been followed in the Halal slaughter of chicken and beef products. 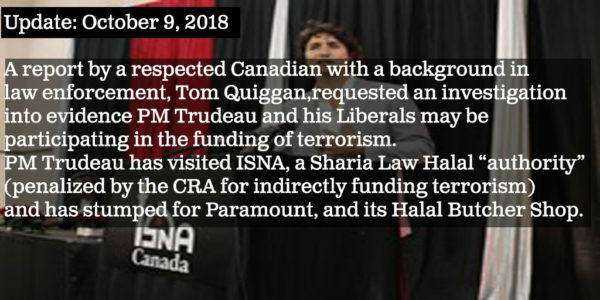 Last week the Canada Revenue Agency penalized ISNA for indirectly funding terrorism. 1. the animal must be alive, not pre-stunned, when its throat is cut. This is contrary to Canadian humane treatment of animal law which requires pre-stunning so that it does not cause the animal to suffer needless pain. 2. an Islamic prayer, typically “Allahu Akbar”, is prayed over the beef and chicken. If you would like to read more on the issue of Sharia Law Halal over recent months, click here. “The attraction to halal is the creeping of [Islamic] fundamentalism into the west,” said Munir Pervaiz, secretary general of the Muslim Canadian Congress, which represents moderate and secular Muslims. Muslims represent 3.25% of Canada’s population yet, at the very least, 30% of beef, and perhaps a higher percentage of chicken, in Canadian grocery stores have gone through the Halal slaughter process. Financially, it is unknown how ISNA operates with regards to its Sharia Law Halal certification duties. This 2007 articles explains how Maple Lodge, a Canadian company, adheres to ISNA’s Halal certification process for the part of Maple Lodge’s product line that is Halal. For Canadians and Americans who are not adherents of Islam, and/or reject Islam outright (about 97% of us), the Islamic prayer itself, often heard in terrorist attacks, being prayed over meat products is most likely objectionable. Nothing against the Canadian and American companies who have implemented the Halal process in some of their product lines. They perhaps were thinking they were filling a need. 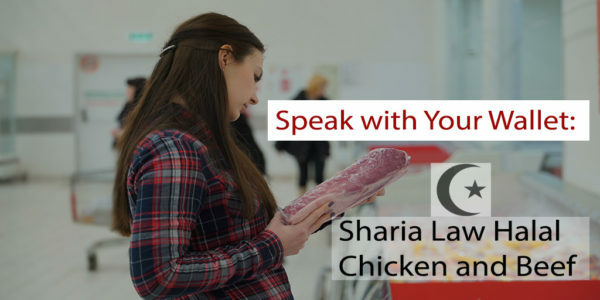 However, consumers should know for themselves what chicken and beef have been Sharia Law Halal processed, and what hasn’t, so that they can make a personal choice. If you don’t want to buy Sharia Law Halal chicken and beef, the below is the start of a list of specific products and institutions selling and serving Halal. You may choose to request non-Halal products for reasons of the humane treatment of animals and/or for religious reasons. A sticker indicating a product is Halal is generally on products; however, as has been exposed in the U.K. this is not always the case. 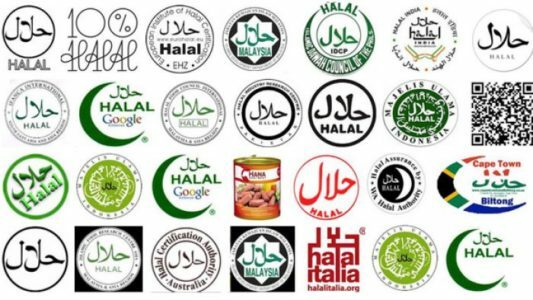 Here are some of the major logos identifying Halal products. If you want to be sure that your beef and chicken are not Halal, grocery stores should be able to tell you the supplier, and if it’s Halal. Note that the companies selling Halal offer their opinion that the slaughter is humane treatment of animals, but they have not been able to convince the Canadian Veterinary Association, SPCA, British Veterinary Association, and most all of the other associations and countries in the world who continue to oppose it on the grounds of the inhumane treatment of animals. Cargill: According to its website Cargill supplies about 50% of Canada’s beef, and half of that is 100% Halal. So not all of Cargill’s beef products are Halal, but a disproportionate amount of it is Halal given only 3.25% of the population is Muslim. 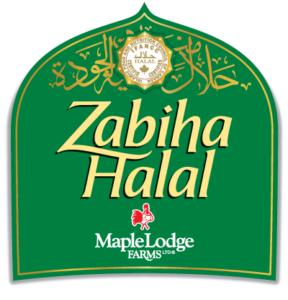 Maple Lodge’s “Zabiha” line of chicken products is 100% Halal. I have a question into Maple Lodge asking if any of their other products go through the Halal slaughter process. There is no indication that is the case. Currently, just the “Zabiha” line is Halal. exclusively serves Halal beef burgers; and the chicken may also be exclusively Halal. exclusively serves Halal chicken and/or beef. This entry was posted in Halal Islamic Sharia Law, Islamic Activism, Sharia Law in Canada, Religious Freedom and Christianity, Think Over News and tagged beef, canada, canada revenue agency, cargill, chicken, grocery stores, halal, isna, maple lodge, meat products, sharia law, terrorist financing.